The Wilkes-Barre/Scranton Penguins have hit rock bottom. A 3-0 lead against the ever-dominant Hershey Bears turned into a 3-3 tie at the end of the second. The tie became a 4-3 Hershey lead on a Mathieu Perreault hat trick. Chris Conner responded with a game tying goal, but the 4-4 tie became a 5-4 Hershey lead, and eventual win, with a minute left in the game. The Penguins are now in sixth place with 48 points and have 30 games remaining. They must finish third in the division to guarantee a playoff spot. If they finish fourth, they must have more points than the fifth place team in the Atlantic Division; who can cross over to clinch that final spot. I’m not convinced they can do it. After yesterday’s game, I gathered my thoughts (I was an angry Pens fan in case you care), and then read the stories in the media and the reactions of other fans that are just as down as I am. I’ve been a fan of the Penguins since 2001 and I don’t think I’ve ever seen so many fans lose hope in February. I read the opinions, the facts, and the excuses. It is hard to swallow but I believe the Pens are at the lowest of the low. The biggest thing that ticked me off is that Todd Reirden and Wade Brookbank are quoted as being proud of the team. They treat yesterday’s collapse as if it happened during an exhibition game in late September. Reirden has said some pretty twisted things all season, but that just makes him and Brookbnak look delusional. Do they not realize the chance to finally beat the Bears was right under their noses yesterday…and they blew it? How can they possibly be proud of themselves after that? If you’ve been paying attention to my coverage of the Baby Penguins, you’ll know that Hershey is very good. But when you have a 3-0 lead with half the game remaining, you have to keep attacking and finish what you started whether your opponent is the Bears or the Hamilton Bulldogs. Friday’s loss to Syracuse was another downer. The Penguins only got one goal from Nick Johnson and allowed three Crunch goals in the second to give Syracuse a 4-1 lead. The fans booed the team off the ice, and the Penguins failed to respond; losing the game by that score. One would think that the Pens would want to show the fans that they were willing to fight tooth and nail for those two points, but they just came out doing the same things that put them in a 4-1 hole after getting on the board first. In a post game article published the day after the Crunch game, Zach Sill stated that he hopes someone finds the problem and fixes it. Sill is a good player, but to say that he hopes someone finds the problem shows that he does not want to take responsibility for his team’s play. I feel none of the players do. They repeatedly say the same thing about how they are not executing and getting away from their system. A lot of the time they do not even understand why they are losing. Not even Reirden has the solution. In the middle of February, when the team has had ample time to play together and learn about each other, it is unfathomable that you can’t find the root of the problem. Everyone says things need to get fixed, but the team continues to have the same problems they spoke about after their prior losses. That screams that there's a huge lack of accountability and shows that they are too stubborn to change. This team does not respond well to any form of adversity. In the AHL, players get called up; sometimes frequently, and every team deals with injuries. When a player goes up or gets injured, there has to be someone willing to step into his place and contribute. It seems like none of the WBS players are raising their game on these occasions. They seem to only think of themselves rather than the teammate they are missing. Unfortunately, I don’t see anything changing with this team. They will continue to play the same broken system and then not be able to figure out what’s wrong when they drop more games. Todd Reirden, who wrongly got the job last season (in my opinion), will probably not be fired and continue to be a poor coach and be more of a friend to the players. The players will probably keep acting selfish and think only of their individual best interests. If these problems have not been handled appropriately by now, I have no reason to think they will suddenly be taken care of as the team sits out of a playoff spot while their opponents are stepping up their games and working hard to get to the postseason. This team is in such dire straits, I could officially care less that Mark Letestu and Tim Wallace are the most recent players returned to Wilkes-Barre after playing in Pittsburgh. I have been excited for the returns of players before, but it does nothing to help the team…so why bother getting my hopes up? 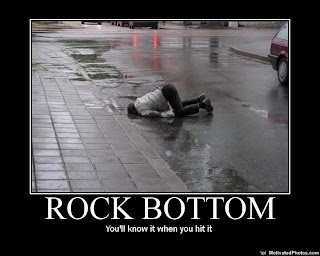 Rock bottom is not a fun place to be, but it’s where the Pens are. And they’re not digging out anytime soon.